April 2018 weather. Meteorologists and climatologists tend to relate current weather conditions to a 30-year “normal”. Until 2021 our current weather is related to conditions that occurred during 1981 through 2010. 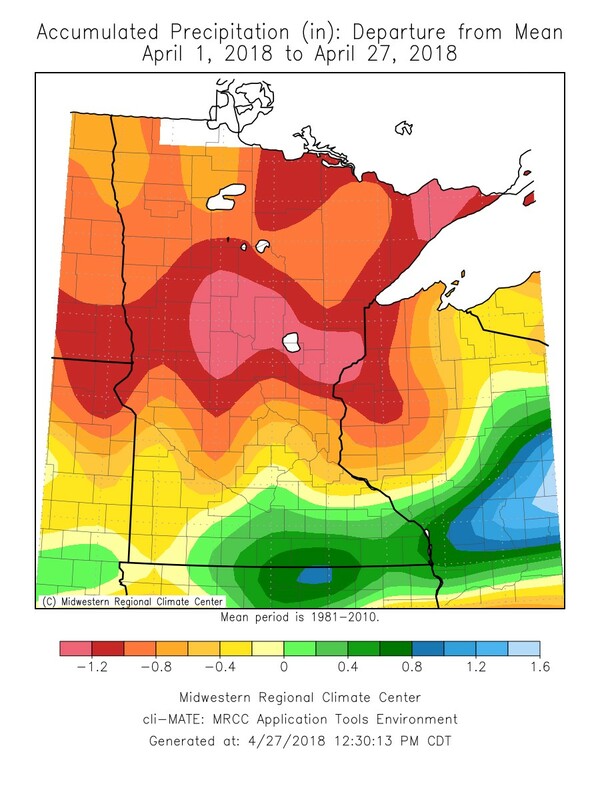 According to the Midwest Regional Climate Center, In April 2018 NW MN counties have accumulated between 0.6 and 1.2 inches less precipitation than normal (See map). More striking though have been air temperatures which have averaged between 8 and 12 degrees lower than normal. Because snow tends to reflect rather than absorb the sun’s energy, those areas of Southern MN and central Wisconsin that a couple of weekends ago were hit with heavy snow have averaged 14 or 15 degrees below normal (See map). The many dangers to planting before soils are fit. Even though fields are warming and drying out a little bit slower than normal, waiting until soil dries out and warms up to begin planting corn and soybeans is advised. Any compaction that is caused by planting into unfit soils in 2018 may reduce a soil’s productivity and limit crop yield potential long after 2018 has come and gone. Some of the worst corn stands I have ever seen were the result of people planting into wet soils. I was glad to have visited the field in the pictures below alone so that the farmer or landowner weren’t present to hear my audible gasp. In this field, planting into wet soils resulted in horrible side-wall compaction. Roots then grew just in the furrow made by the planter and didn’t form a nice root ball instead fanning out in the furrow (top R). There was also poor, uneven emergence overall with gaps between plants so large that some plants actually sent out tillers (top R). Even when damage is not as severe, wet or cloddy soil can lead to poor seed to soil contact and poor stands (bottom). Soybean plants have some ability to compensate for missing neighbors by forming side branches. Corn stands, however, are particularly vulnerable to uneven emergence. Research has shown between 6 and 9% of yield can be lost when some plants emerge 1 ½ weeks later than their neighbors. Yield losses can be greater than 20% when a portion of a stand emerges 3 weeks later than the rest (Carteret al. NCR 344). Later emerging plants are unable to compete with larger neighbors that can access more sunlight, water and nutrients due to their comparatively larger size and are often barren. The bottom line: yields are often similar or higher when planting is simply delayed until soils are drier. 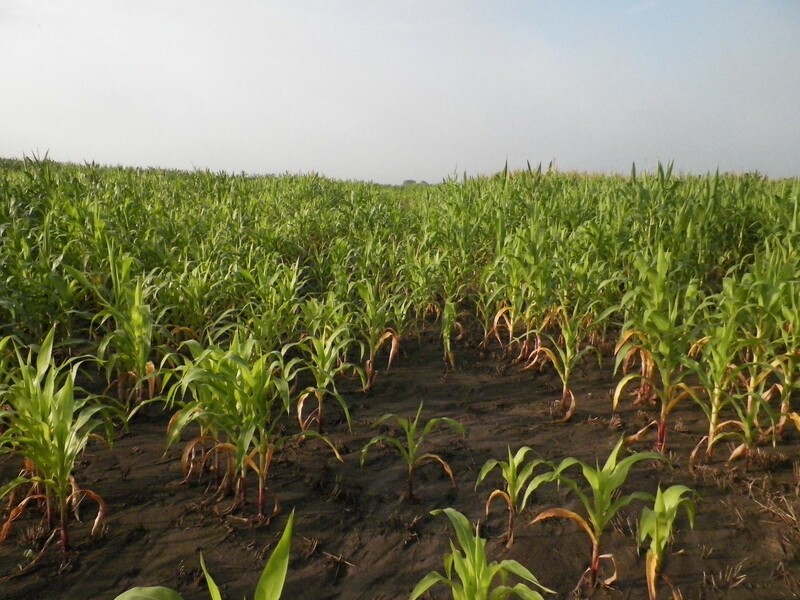 Even if fields are dry enough to plant into, planting into low temperature soils is risky. Seeds passively absorb water from the soil around them and are particularly vulnerable to cool soils during the first 24 hours after planting. If seeds absorb water colder than about 50 degrees, cell damage can lead to poor seedling vigor or even death (Licht, 2014). Both corn and soybean seed can germinate at soil temperatures around 50 degrees, but germination is really slow. Plants aren’t warm-blooded and have to rely on the heat in their environment to drive the cellular processes needed for growth and development. While the network of NDAWN weather monitoring stations can give us some clue as to soil temperatures around the region, there is no substitute for checking soil temperatures in your own fields as differences in topography, crop residue, water-holding capacity and soil type can affect soil temperature. Some farmers perennially battle seed and seedling diseases in certain fields. A seed is particularly vulnerable to soil-borne pathogens when it absorbs water and low temperatures slow germination and emergence. Seed often comes coated with seed treatment fungicides. But these expensive inputs can only protect the seed for so long (~21 days) before they begin to lose efficacy. Planting into cold, wet soils can put seeds and seedlings at risk, even when they come armored with seed treatment fungicides. 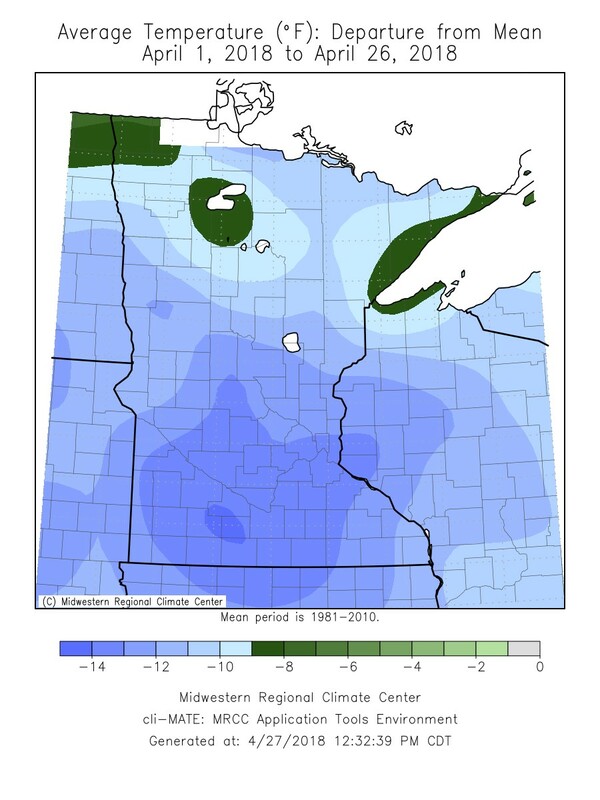 Bottom line: with warmer air temperatures and windy weather, soils are drying quickly. To set up our 2018 crops for success, it is important to remind ourselves to be patient and wait to plant until soils are drier and warmer.